Canadian Prime Minister Justin Trudeau brought a personal gift to President Donald Trump Monday. Trudeau brought a photo of Trump with Trudeau's father, the late Canadian Prime Minister Pierre Trudeau. Trump says it is a picture of the two at the Waldorf-Astoria hotel in New York. Trump says he knew Pierre Trudeau and respected him "greatly." He said he would keep the photo in a "very special place." Trump and Trudeau had their first face-to-face meeting Monday. 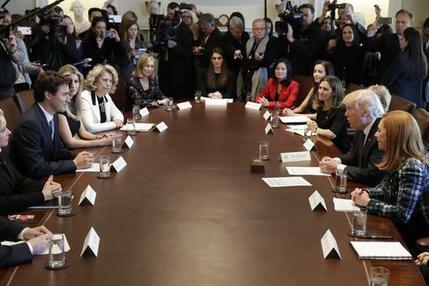 Trump spoke during a round table discussion on women in the workforce. President Donald Trump says he is looking to work with Canada's Prime Minister Justin Trudeau to ease access to capital for female entrepreneurs. Trump and Trudeau are taking part in a round table discussion about women in the workforce as part of their first official meeting. Trump says the "system is not working so well for entrepreneurs" - particularly for women. Trudeau adds that having "women in business is a powerful leverage for success." Trump's daughter, Ivanka Trump, attended the meeting and helped recruit participants and set the agenda. The two countries will announce a joint task force and are expected to discuss issues like childcare and maternity leave. Canadian Prime Minister Justin Trudeau is at the White House to meet with President Donald Trump. Trump welcomed Trudeau with a handshake Monday, as the leaders met for the first time. Their schedule includes private talks and a round table conversation about women in the workplace. Trudeau and Trump have different world views. The liberal Trudeau champions free trade and has welcomed 40,000 Syrian refugees. Trump has taken a protectionist stance on trade and wants to crack down on the inflow of migrants and refugees. Relations with the U.S. are crucial to Canada. More than 75 percent of Canada's exports go to the U.S. There is a fear among Canadians that they could be hurt as Trump targets Mexico in a re-negotiation of the North American Free Trade Agreement. Canadian Prime Minister Justin Trudeau arrives in Washington, aiming to build a relationship with President Donald Trump that doesn't threaten trade. In the first face-to-face meeting with the new U.S. president, Trudeau will talk about free trade at the White House. The two leaders will also participate in a roundtable discussion about women in the workplace. The prime minister's plane landed at Dulles airport Monday morning after heavy winds forced a change from Andrews Air Force base."